Provide comfort for the family of Nancy Frangipane with a meaningful gesture of sympathy. 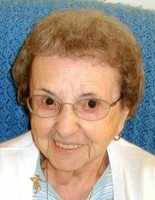 Mrs. Nancy L. (Pignone) Frangipane, 92, formerly of Berkshiretown Apts., 176 Columbus Ave., Pittsfield, MA passed away Friday, January 25, 2019 at Mount Carmel Care Center in Lenox, MA. She was born in Pittsfield on March 25, 1926 a daughter of the late Frank and Louisa (Spezzaferro) Pignone. Nancy attended Pittsfield schools and was employed by the former Elmvale Worsted Co. and then the Berkshire Eagle, retiring in 1990 with 16 years of service. She was a communicant of the former Our Lady of Mt. Carmel Church and a member of its Ladies Guild. Nancy enjoyed cooking, baking, crocheting, bingo and playing pitch. Her joy was playing with “Madi” her niece’s Maltese dog. Her husband, Joseph R. Frangipane died on November 16, 1976 and they were married on August 1, 1959. Survivors include her nieces, nephews, great-nieces and great-nephews. Nancy was predeceased by her three brothers, Louis A. Pignone, Joseph V. Pignone, Ralph A. Pinyone and her five sisters, Frances M. Wixsom, Rose G. Charow, Carmen M. Buffi, Angelina F. Becker and Teresa A. Dallava. Funeral Notice: Services will be Thursday, January 31, 2019 at 9:00 A.M. from the FLYNN & DAGNOLI-BENCIVENGA FUNERAL HOME, 5 Elm St., Pittsfield, MA 01201. A Liturgy of Christian Burial will be celebrated at 10:00 A.M. at Sacred Heart Church with the Rev. Michael Bernier, Pastor officiating. Burial will follow in the family plot at St. Joseph's Cemetery. Calling Hours at the funeral home will be Wednesday, January 30, 2019 from 4-7 P.M. In lieu of flowers, memorial donations are suggested for OUR LADIES KITCHEN in care of the funeral home. To add to the Book of Memories, please visit www.flynndagnolifuneralhomes.com. To send flowers in memory of Nancy L. Frangipane (Pignone), please visit our Heartfelt Sympathies Store. Provide comfort for the family of Nancy L. Frangipane (Pignone) by sending flowers. "Miss Nancy lived a long and blessed life. (Psalms 90:10) God promises a time when "death will be no more," and "those in the memorial tombs will hear his voice and come out. "(Revelation 21:4;John 5:28,29) During this time of sorrow, these promises can comfort and give you hope. The hope of seeing your loved one again. (Acts 24:15) My condolences." My deepest sympathies to the family and friends of Mrs. Frangipane. I was privileged to know her just a bit during her time at Mount Carmel Care Center. She and you are in the prayers of myself and all the Carmelite Sisters for the Aged & Infirm, sponsors of Mount Carmel Care Center. May she rest in peace in the presence of Our Lord.